The first officer of the USS Enterprise, Mr. Spock, is one of the most logical officers Starfleet as ever seen. He is always the one Captain Kirk turns to whenever needs to get some information or a different perspective on a situation. There's only one problem, we've never been able to figure out how the Vulcans decided on their instantly noticeable hairstyles. It's a little bit Medieval monk and a little 1920's flapper. Maybe it was to compliment their pointed ears but we're guessing we'll never know. This Halloween you'll get a chance to look like the coolest Vulcan in all the galaxy when you wear this wig and ear set. You'll be ready to solve problems and embrace your new unemotional state. Practice your emotionless persona by watching Kleenex commercials and clips of people getting puppies as gifts. 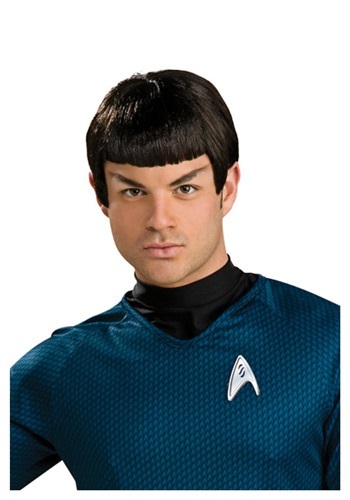 If you can watch all of that without a tear, then you're ready for your new Vulcan lifestyle!